This article is about the novel. For the 1959 film adaptation, see The Wreck of the Mary Deare (film). 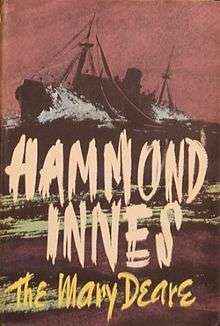 The Wreck of the Mary Deare is a 1956 novel written by British author Hammond Innes, which was later adapted as a film starring Gary Cooper released in 1959 by MGM. It tells the story of a very old ship described as "A deathtrap of rattling rivets", which is found adrift at sea by salvageer John Sands. Sands boards it hoping to claim it for salvage, but finds the first officer, Gideon Patch, still aboard and trying to run the ship on his own. Patch convinces Sands to help him beach the ship, even though it will void his salvage claim. When they return to London, Patch is brought before a board of inquiry to determine what happened. It soon becomes apparent that the ship owners were planning to wreck the Mary Deare all along and have Patch as the fall guy.